Chili and I have had quite a few run-ins over the past year. First-date-like encounters that leave you asking yourself, is this really the one? Or is it the one for right.now? Can I see myself growing old with it? Feeding it to my kids, grandkids and (fingers crossed) great grandkids? Will we survive the good, the bad? The better, the worse? I can tell you from experience that you can’t know for sure until you do find it. You take one bite and all of a sudden you’re picturing white houses with picket fences (and no darling boyfriend, this does not mean that I ever want to leave the isle of Manhattan. It’s a metaphor), a pie in the oven and a pot of chili…this chili…bubbling away on the stove. Yes, really, when it all comes down to it. It’s as simple as that. So what is so special about this chili, you ask? I can’t quite put my finger on it. Maybe it’s the beans. Or the excessive(ly awesome) amount of veggies. Or the smoky heat from three different kinds of chiles and a heck of a lot of cumin. Who knows. I don’t think it’s the kind of thing you can explain, or would want to even if you could. All I can say is – make it. Pair it with this beer bread, which is fabulous on so many levels. And if it’s right…you’ll know. 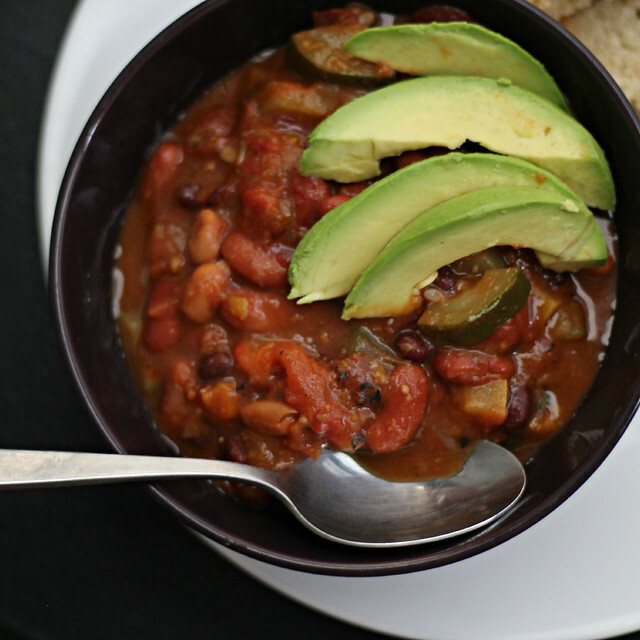 This smoky chipotle vegetarian chili is so richly flavored that you won't even miss the meat! And it's heat is paired perfectly with this cheesy parmesan-black pepper beer bread. For the chili, heat the olive oil in a large pot over medium heat. Add the onions and peppers and saute until they begin to caramelize, about 8 minutes. Add the zucchini and summer squash, sauteing about 5 minutes or until tender. While the veggies are cooking, in a food processor, combine the garlic, cilantro stems, green chiles, chipotle chiles, and ½ cup broth. Pulse to combine. Add the tomatoes and the chile mixture to the pot of veggies. Bring to a simmer. Add in all of the beans, salt, chili powder, cumin, oregano, and beer, as well as the remaining broth. Simmer, uncovered, stirring frequently, until the liquids thicken and the veggies begin to break down, about 30 minutes. For the beer bread, preheat oven to 375. Lightly grease the loaf pan and set aside. Place flour, sugar, baking powder, and salt in a large bowl. Add the beer, ¼ cup melted butter, parmesan cheese and black pepper. Stir to combine, but only until the dough just comes together. Pour the mixture into the loaf pan. Top with the remaining butter and bake for 1 hour or until a tooth pick comes out clean. Allow to cool until just warm before slicing. Talk about comfort food on both accounts Joanne. gah! that combination sounds amaaaazing! 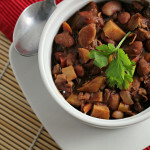 Gorgeous stew… rustic bread. Totally after my heart with this one. Happy birthday Joanne! Looks like we both had beer on our minds weekend. Rob made beer fries which were delicious. Does this chili taste like beer? Between the chili and tons of veggies and cumin and the black pepper/parm bread, I love this post! all look delicious Joanee but I love your bread amazing!!!! Oooooh, this chili does sound just wonderful! And that beer bread? I HAVE to try it. I love chili so very much, but don’t have ‘the one’. I flit around from one chili to another. Someday I’m sure I’ll find the magic one for me! This one here will definitely be given a try. I love the cilantro stems and chilies included in sauce. That is my idea of a perfect meal, beans, avocado and bread. I am trying to fit in all the soups, stews and chili’s in before it heats up. I love one pot cooking. For as long as I can remember, I always made my chili with beans (and sometimes ground beef.) And then a few years ago, a bunch of people (not just one, but seriously a bunch) all of a sudden started getting on my case that chili should be made with stew meat, and possibly no beans at all. What the whaaaa? That is craziness. So I Googled it (of course) and apparently, traditional chili (or at least chili from Texas), sure enough, is made that way. But I don’t live in Texas, so um… I’m making mine with beans. And sometimes ground beef. And maybe with veggies. And chipotle. And maybe soon, because it’s been far too long. I want it all!! Girl, we need to hang out together and eat your fantastic recipes! Everything looks so good!!!!!! Chili is my all time favorite food. I love trying new chili recipes and this sounds full of flavor. happy birthday joanne! this chili sounds amazing. i’ve recently fallen in love with chipotle peppers in soup…and in chili i bet they are even more amazing. yum! Three kinds of chilis AND beer bread?? I’m there (with my own bowl and spoon, so I hope there’s plenty to go around 😉 ). 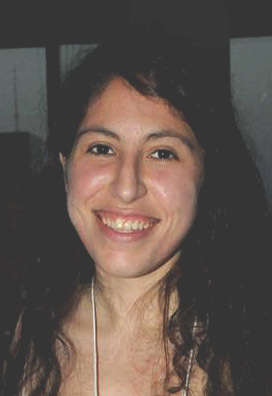 Happy Birthday, Joanne! I hope today is both fabulous and normal. Thinking of you! Wow, I could use a big bowl of this right now. 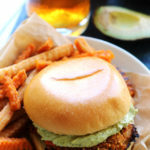 An entire post of comfort food. I love it! You can’t do this to me! I haven’t eaten breakfast and I want this deliciousness now for an early lunch. It might just be the one! It looks tasty and so does the beer bread. she passed away decades ago, but I still miss her. I have been all about bread lately – trying to hone the craft, as it were. And, ever since the beer-glazed black beans came out so good I think beer maybe my new favorite enhancer. 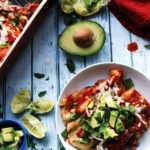 I love chili and that bread sounds fantastic!Love the addition of avocado slices! I actually don’t like beans (and believe me, after nearly 14 years as a vegetarian, I tried them in many applications). 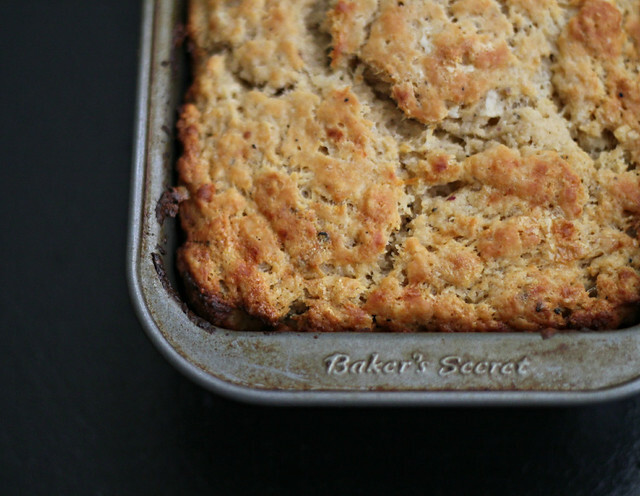 However, beer bread is always welcome–it never ceases to amaze me how something so easy can taste like ‘real’ bread. Happy Birthday my friend – hope you have the best day! I love canned green chiles to add a unique flavor to food, I use them all of the time! Wow im looking forward to the winter so I can make this. I have a friend who would go crazy for this. how did you know that a cold front just moved in and we are craving chili?! That parmesan beer bread sounds amazing! 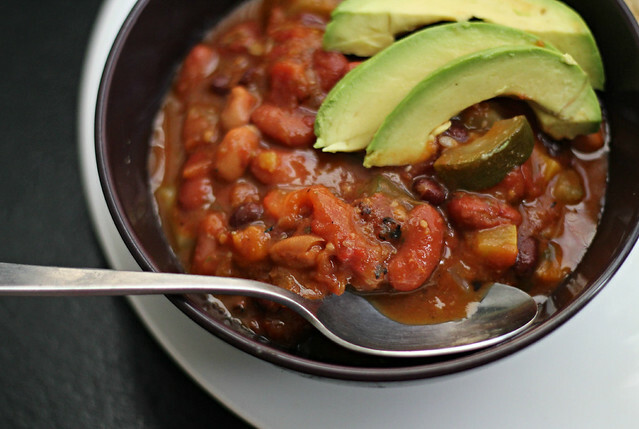 I love how many veggies are in this chili – it looks fab! And beer in there AND beer bread? Um…yes. So many beans and veggies in this chili, I love it! The bread sounds really good too, I bet they go so well together! Wow…I love your enthusiasm for this chili. It has to be very good so I thank you for sharing the recipe. I love spicy chili with corn bread, but this beer bread looks like it would make a better pairing!! I still haven’t found that perfect chilli for me so I’m definitely going to try this one! This looks like a delicious meal! I love the beer bread with the black pepper – very yummy. Plus I love fresh avocado on top of some chili! Both recipes sound fantastic, but your beer bread recipe has especially caught my attention. The only beer bread I’ve ever had came from those terrible Tastefully Simple mixes…I know, I know but my co-workers are always hosting parties and I feel obligated to buy something. chili makes a frequent appearance in our house too and it’s always a battle between my husband and i over who makes the best one (it’s me). this looks just awesome, i love the smoky flavors, and the bread looks perfect with it! 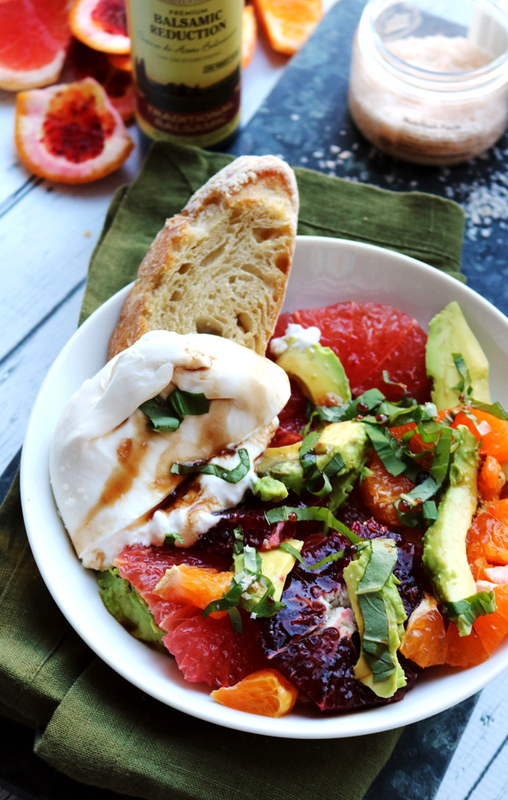 That looks so good – especially with avocado on top. I haven’t found the perfect chili yet but I haven’t tried that hard either .. I feel like it’s an important recipe to have in your arsenal though! I’ll have to give this recipe a try next! Whoa, way too high on the Scoville scale for this girl. I’d have to title it “fire in the hole”. 🙂 Looks good though! The beer bread sounds delicious! Just saw another post mentioning beer bread and I’ve been itching to make one. Oh, and HAPPY BIRTHDAY my dear! Hope it was completely wonderful!!!! This sounds like a gorgeous dish – and also, happy birthday! Cumin gives a middle eastern flair to all dishes! I am sure this chili has this special flavor to be come a staple and the bread matches perfectly! I love that there’s beer in your chili and your bread. I did that once too-great minds! Also, I love your chili esp since I have almost everything to make it and was planning on making a big pot tomorrow (looking like it’s gonna be a snow day as the roads are totally covered in over a foot of snow and undriveable). Thank you for the inspiration! BTW, it’s crazy that you call for cilantro stems. Perhaps the only recipe I’ve ever seen that calls for them. What is up with that anyway? So you can save the pretty tops for garnish? 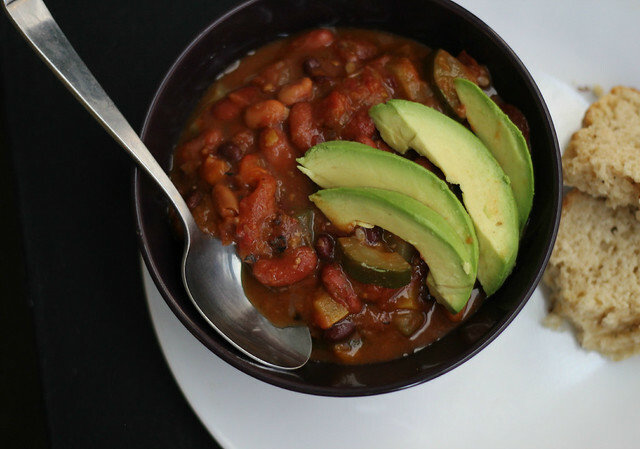 Now that is a vegetarian chili….wow! Another one that I want to try! And a belated Happy Birthday to you! Ooh this chili looks fabulous. Even though I eat meat- I always prefer veggie chili. And about that bread- I’ve been seeing some amazing beer-quickbreds lately and I love them! I bet it has the best malty taste! That beer bread looks delicious. I used to get the beer bread mix from Trader Joe’s (pour mix in bowl, add beer, bake), but they don’t make it anymore, so I guess I need to start making my own! I love the idea of doing it with Parmesan and black pepper. This chili sounds pretty damn good, I don’t think I’d care that it is meatless. Ooo, that sounds delicious! I’ve only tried one chili – Greens restaurant black bean chili – but this one sounds much more complex and full of other bits of deliciousness. While I love chili, I just keep eyeing that bread. It looks amazing! I am loving the trio of beans in this chili and that bread! Perfectly matched with the chili and destined for dipping! I can always use another yummy chilly recipe! Mmmm! YES! Vegetarian chili! You’re awesome. As a pescatarian I give you props. 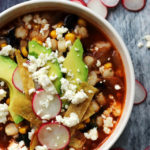 I have made vegetarian chili with the Morning star crumbles before but I don’t think I’ve ever tried one with just veggies, this looks so tasty, I must try it! Excuse me? Hello? 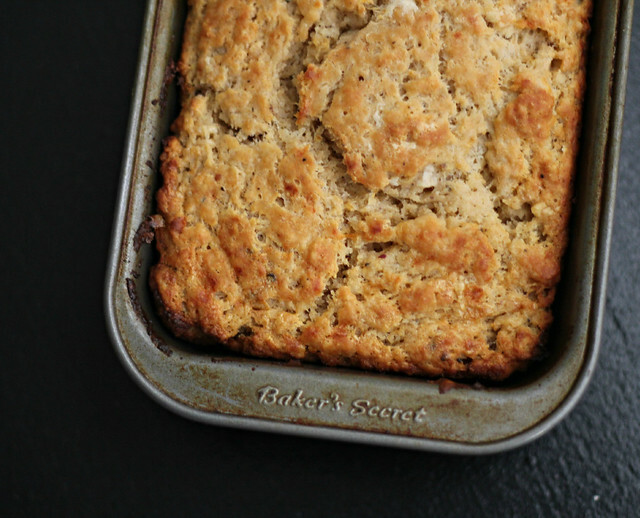 Parmesan Black Pepper Beer Bread – be still my heart! This chili sounds amazing as well…but gah…you’d have a hard time prying this loaf away from me. This would be perfect for the nasty cold wintery weather we are having up here in Narnia. I think I’m in love with that bread. Seriously. wow, why didn’t you make this earlier in winter so i could make it? just printed that one out. Great looking chili, and I’m craving that bread! I make savory parmesan/black pepper biscotti and love them, so the bread sounds awesome. every bowl of chili needs some awesome bread to be eaten with it, even this delightful vegetarian version, which you seem to have absolutely packed with flavor! wow! That chili and the bread both sound incredible. hello veggies. and why haven’t i been pairing beer bread with chili before? awesome dish girl! I am always down for trying a new chili recipe…and a new beer bread recipe while we’re at it! yum and yum! 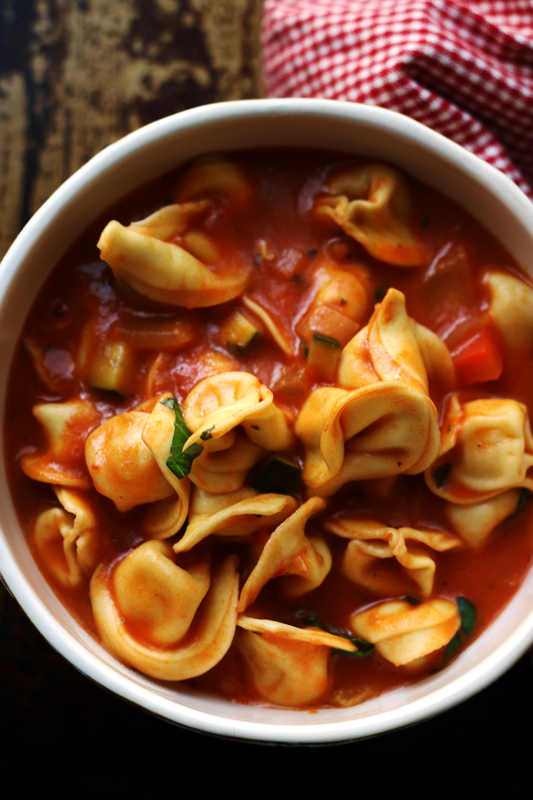 Oh man this screams comfort in a bowl. I just need to soak up that pepper bread with this chili goodness here and I’m in heaven! I make a similar veg chili, but next time will add the beer bread!! Delicious! 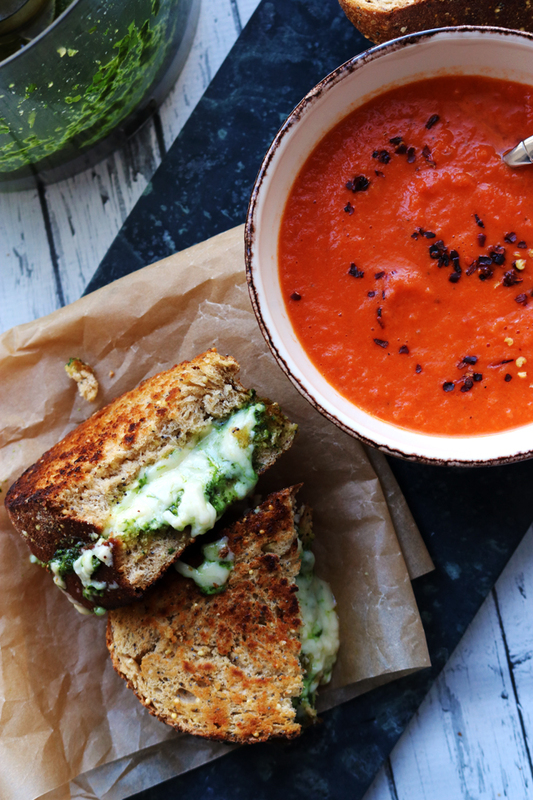 I love the fire roasted tomatoes in this. I’ve used them a few times in other recipes and they really make’em sing. Look forward to the vegetable awesomeness on this chili. 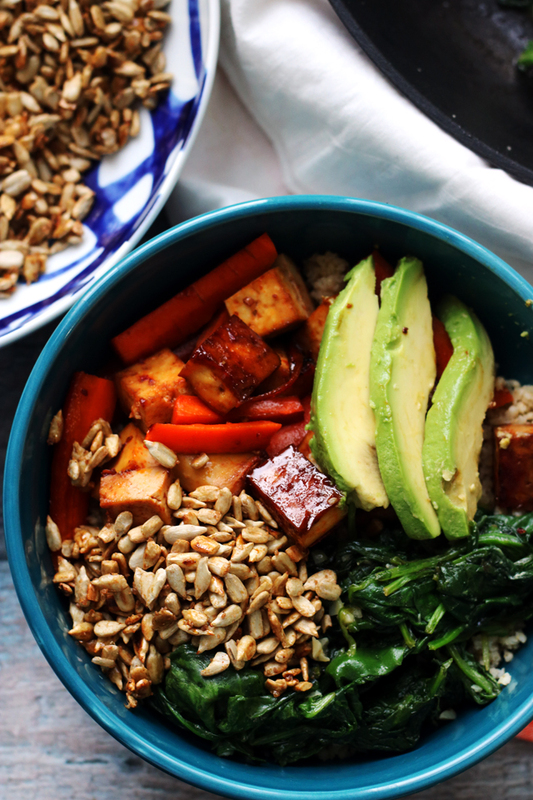 Mmm… this looks so hearty and good. Loving the avocado on top too. 😉 Thanks for sharing with Souper Sundays this week. One of the things I love best about chili is that I stopped looking for the one, stopped measuring or looking at recipes, and just accepted that it would turn out as the whim took me lol! This one looks delicious and the bread is perfect. This looks way yummy. I do believe I could totally serve this to my carnivore husband and he wouldn’t put up a fight. Even though spring has sprung here in the South, we’re having a cold snap with temps in the 20’s at night . . . this would be a perfect chili to warm the bones . . . and the soul. 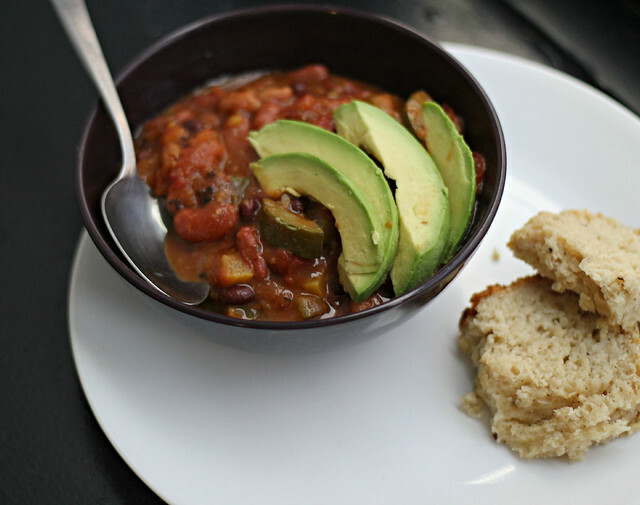 The bread that you paired with the chipotle-flavored chili is just perfect Joanne!